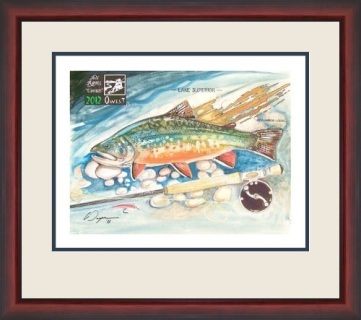 At QE you'll find Fly Fishing Art for the sporting art collector. 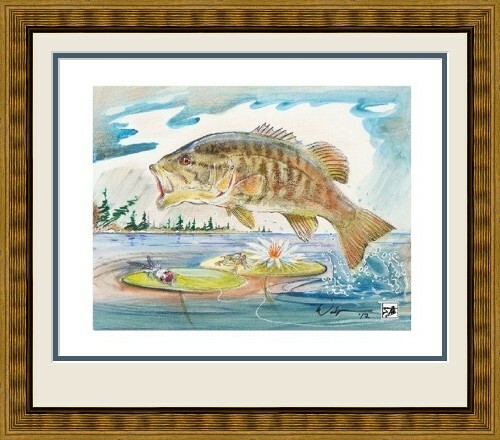 You'll also find Fly Fishing Books and some outstanding QE Journal posts written by a cadre of fresh new American fishing writers. All meant to inspire your next fly-fishing adventure. Scroll down and start with the Art! Four classic wet flies courtesy Bob White. Enjoy Bob's website at www.bobwhitestudio.com or just click on this image. Quality prints by painter-illustrator Wayne Snyder and some offered in Limited Edition numbered prints. 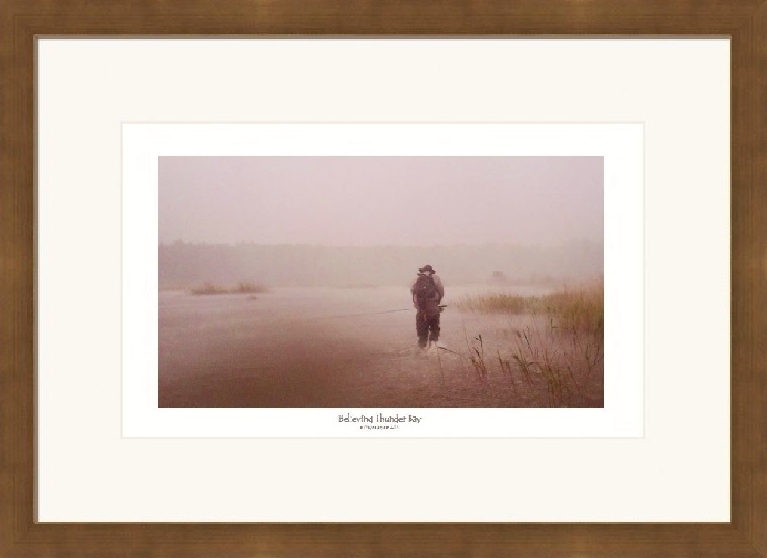 A haunting image of wicked wind, pelting rain, fly fishing and lonesome wandering. Giclée print on matte canvas paper. The print image is 5" X 10" with a 1.25" white border. Print only (suggested framing shown). ​TEMPORARILY UNAVAILABLE. Out from darkness. The magnificent Michigan Coaster brook trout in its natural element - the cold, clear waters of Lake Superior near the confluence with the Eagle mine threatened Salmon Trout River. Only 10 Limited Edition S/N prints of this painting will be offered. This is Wayne's contribution to the Michigan Artists United for Michigan Coasters venture and 10% from sales of "Salmon Trout Warrior" prints will be donated to The Greater Lake Superior Foundation (see below). Print only (suggested framing shown). The print image is 18" X 24" with a 1.25" white border on quality textured paper*. The Greater Lake Superior Foundation is a not-for-profit private foundation dedicated to the preservation of Lake Superior's coldwater fisheries. The Foundation's Coaster Brook Trout Research Unit is a research initiative designed to help restore Coasters. 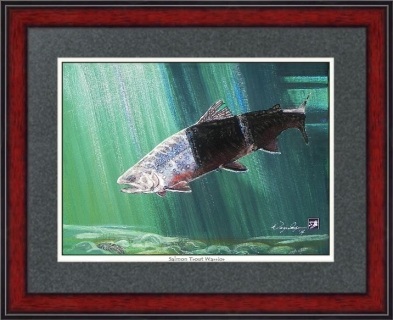 A homeward run of the Chinook "King" salmon is a sight to see. Think rainfall or snowfall they can come in so thick sometimes. Thus, "Riverfall". 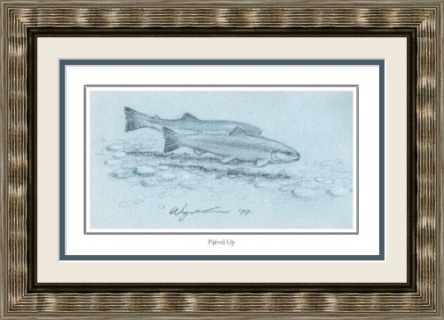 ​The print image is 10" X 22" with a 1.25" white border on quality textured paper*. Only Open Edition prints will be available. Print only (suggested framing shown). TEMPORARILY UNAVAILABLE. Perfect for that rustic cabin on the lake. 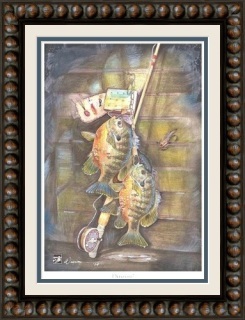 Bluegills by name and slabs they are! The stringer, poppers and spiders allude to a classic, time-honored method of harvest. "Dinner!" will be offered in 15 Limited Edition signed and numbered prints. 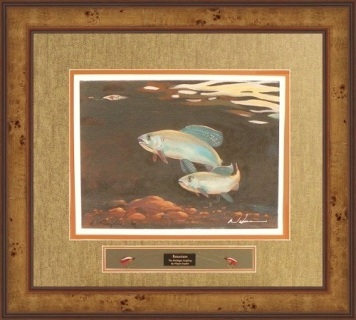 The print image is 16" X 23" with a 1.25" white border on quality textured paper*. Print only (suggested framing shown). Painted not only to commemorate a recent journey to Isle Royale, but to capture and portray the stunning beauty of the native Michigan Coaster brook trout. The print image is 16" X 20" with a 1.25" white border on quality textured paper*. Only Open Edition prints are available. Limited Edition numbered prints are no longer available. Print only (suggested framing shown). Shipping is additional charge arranged with printer. 10% from sales of "Isle Royale Coasters" prints will be donated to the Yellow Dog Watershed Preserve (see below). The Yellow Dog Watershed Preserve began mainly as a land trust and the Land Preservation Program has acquired and set aside 412 acres in the Salmon Trout and Yellow Dog River watersheds. YDWP annually organizes volunteer stream monitoring programs on Michigan's sulfide mine threatened Salmon Trout River. 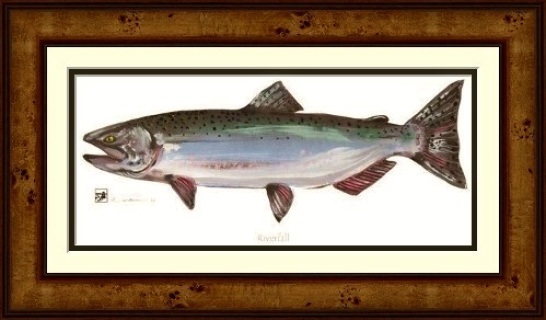 The Salmon Trout is one of the last rivers in the Upper Peninsula where native Michigan Coasters are known to spawn. TEMPORARILY UNAVAILABLE. Mr. Smallmouth, the Gentleman, 'Ole Red Eyes, Bronzeback...yep, he's all of these. 10 Limited Edition Prints will be signed and numbered in the order they are purchased. The print image is 16" X 20" with a 1.25" white border on quality textured paper*. Print only (suggested framing shown). Original painting is available for $200. The beautiful Michigan grayling is now extinct. 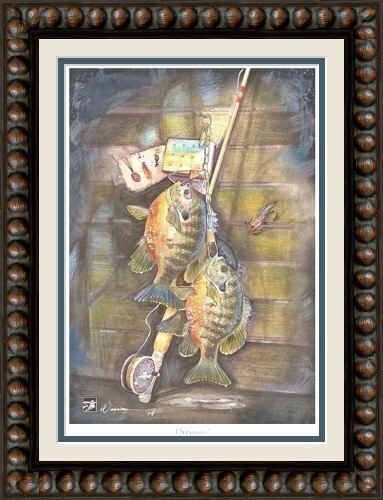 However, its likeness is preserved forever in this haunting print entitled "Reunion". The print image is 12" X 16" with a 1.25" white border on quality textured paper*. Only Open Edition prints are available. Print only (suggested framing shown). Shipping is additional charge arranged with printer. TEMPORARILY UNAVAILABLE. 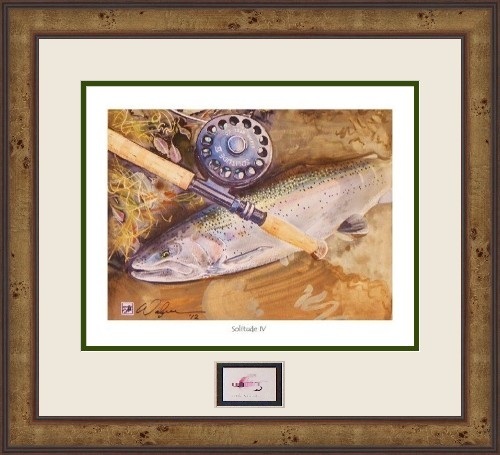 A memorable Steelhead catch on Michigan's Clinton River. And don't overlook the iconic Harris Solitude reel. Limited Edition signed and numbered prints are available. TEMPORARILY UNAVAILABLE. A pair of Steelhead on the redd is a sight to behold. When the light is just right they can appear to hover like specters in mid-air. Signed print on quality 45 lb white matte finish paper. The image measures 5" X 9" with a 1" white border. Print only (suggested framing shown). Original is available for $100. TEMPORARILY UNAVAILABLE. It's huge for a Michigan dry fly. It's about 3 1/2" long overall. 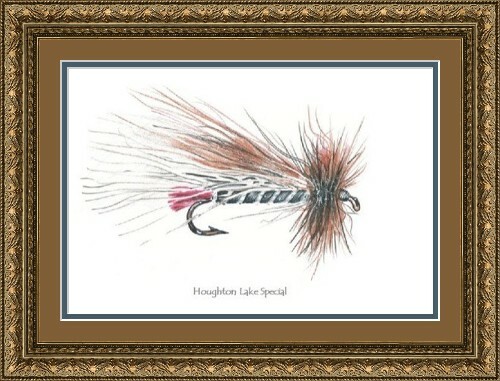 It's the Houghton Lake Special invented by Bob Jewel. Signed print on quality 45 lb white matte finish paper. The image measures 5" X 7" with a 1" white border. Print only (suggested framing shown). * Larger prints are created using Epson Cold Press Bright Paper. Epson Cold Press Paper is an acid-free 100% rag media with a textured finish. The archival quality is estimated at 200 years under museum conditions when printed with Epson UltraChrome inks, which is what we use.